When’s the last time you had a great idea while you were staring at your email? I’m going to go out on a sturdy limb and say never. My best ideas have arrived in the shower or while I’m walking to lunch. Never while I’m battling the alerts from email, texts and social media that demand my attention RIGHT NOW. If you’re the typical white collar worker, you check your email every six minutes or so, all while trying to do your actual work. There’s nothing slow about that — it’s freaking frantic. So we call for the mythical hero of multitasking to save us from this mess…except it’s the villain. Stanford professor Clifford Nass’s research found that multitasking wastes more time than it saves. What are ambitious and driven people to do? Ditch our phones? 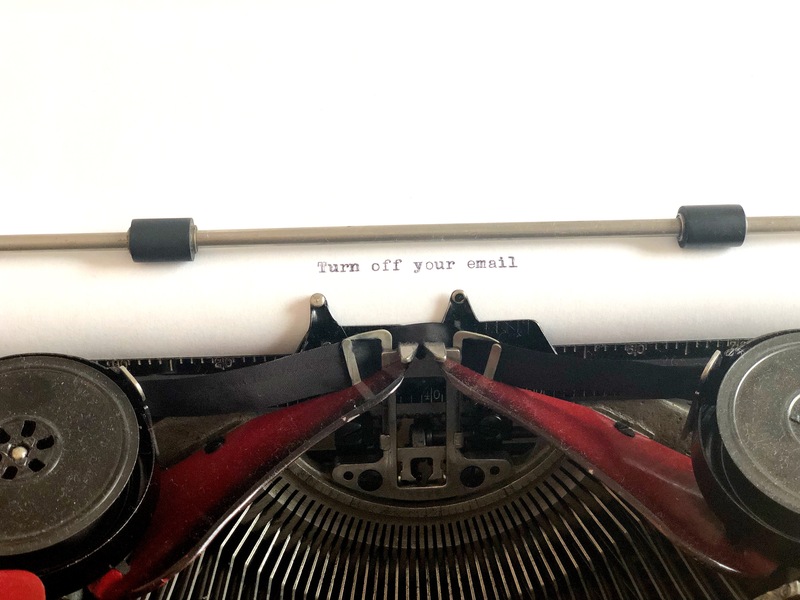 Return to the epistolary days of handwriting and typewriters to slow down our thinking? Well, that actually works, and my nostalgic side would like nothing more, but I’ll give up my handbag and all of its contents before I’ll hand over my iPhone. People take priority over messages: Distracted conversations produce unfocused outcomes. Eye-to-eye understandings can’t happen with our eyes cast on our screens. My laptop is situated at the side of my desk so my focus is on the human being sitting in front of me. It gets closed during important meetings and calls and if I need to use it, I turn off my email. I also leave my phone face down on the table with its ringer off. I encourage everyone else to do the same. Trust liberates critical thinking: Too many employees, eager for recognition, burn out trying to prove their dedication by being online, all the time. Their managers keep them on digital tethers, and that communicates the wrong priorities. Who’s going to get brave and suggest a shift to your strategic plan if they’re worried you’re going to be angry because they didn’t respond to a 10 pm email? Trust liberates critical thinking. At InkHouse, we trust our employees to take time when they need it. Our vacation is unlimited, our hours are flexible, and everyone works from home on Fridays. We measure our work in results, not hours. Perspective requires space between the chaos: Our minds need to wander away from a topic before they can see it clearly enough to dive back in and discover something new. In other words, we need to step away from our work to be effective. InkHouse initiated a no email rule between the hours of 7 pm and 7 am. Sure, there are exceptions. Balance isn’t about having a smooth ride, but about coming back to center and creating the intention to do so. Our policy exists to communicate that intention.